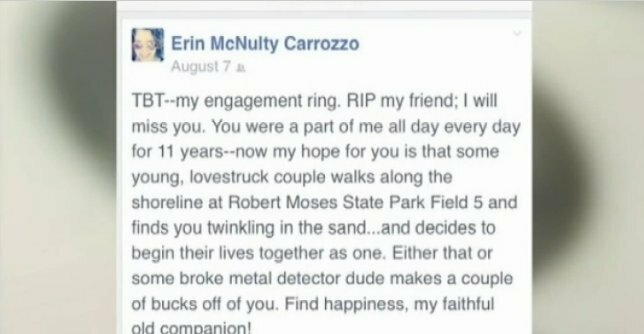 When Erin Carrozzo lost her diamond wedding rings in the sands of Fire Island, New York, she assumed she would never see them again. The mother of three even wrote on Facebook, "RIP my friend I will miss you. You were a part of me every day for 11 years, now my only hope for you is that some lovestruck couple ... or some broke dude with a metal detector makes a couple bucks off of you," reports NBC 4 in New York. Luckily for Carrozzo, that "dude" turned out to be Mike Cogan, a retired fireman. "I took it out of my scoop and it was very heavy," Cogan told NBC 4. "I saw it was inscribed, and I said, 'This isn't a kid's ring. This is platinum and these have to be real diamonds.'" Rather than sell the treasure, Cogan knew what he had to do. "I knew how empty she had to feel. I don't want anybody to feel like that, so I started my search," he said. He posted the rings on Facebook, hoping the power of social media would work its magic. It did. After just 10 days and numerous Facebook shares, the two were connected. "Getting in touch with her was as good as finding the diamonds," Cogan said. To which Carrozzo replied, "I'm amazed how much good there is in the world." So are we! Watch the video above for more on this touching story.